Apparently I’ve kept this cornbread stuffing recipe to myself for the past two years. I know, it’s really not very charitable. But now it’s finally time to get this recipe to you and you’re going to love it. This stuffing is packed with those Thanksgiving flavors you’re craving (It’ll make your house smell great.). It’s amazing as a turkey stuffing, but it’s also delicious baked on it’s own - I provided instructions for both. And yes, it’s totally low-FODMAP & gluten free, but make the whole batch because EVERYONE will love this. My excuse for not sharing sooner is that I’ve been tweaking the cornbread recipe. It’s a super-simple, southern-style cornbread (in other words, not packed with sugar or other embellishments). Since it’s made with only cornmeal and technically gluten-free, it’s a tiny bit crumbly. But that is perfect for stuffing. I’ve tested out many many gluten-free cornbread recipes - from gummy and unpleasant to totally edible - before landing on this version. It turned out the simplest ingredients produced the best result. There are extensive notes for this recipe because it really is flexible! But it’s also simple and straightforward, especially if you bake the cornbread a day or two ahead. Once you try this, you won’t want to save it just for Thanksgiving...I definitely don’t. 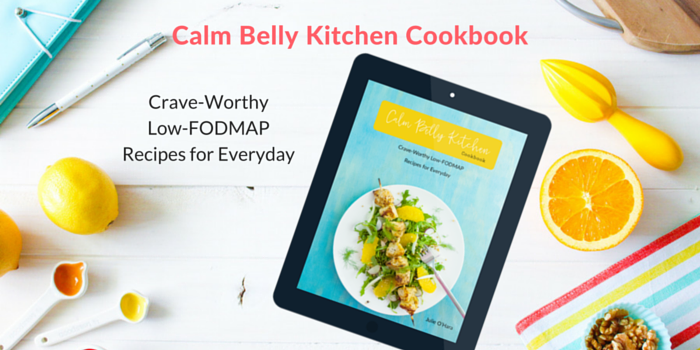 Need a hand with FODMAP? 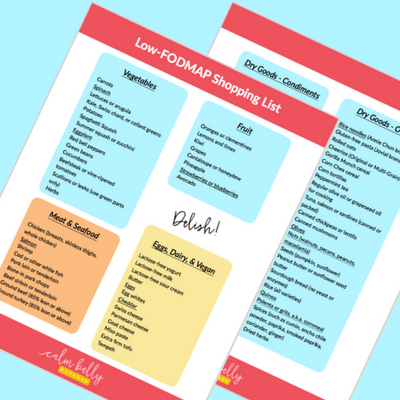 Click to get your free FODMAP Diet Shopping List! This stuffing is flexible: Swap the pork for smoked oysters (trust me! ), roasted chestnuts, or any kind of sausage you tolerate. Giving the ground pork plenty of seasoning makes it taste like sausage. You can swap in any low-FODMAP spices you like - If you're not a fan of smoked paprika, try regular sweet paprika. If celery (the amount per serving is well under the low-FODMAP limit) doesn’t work for you, go with or parsnips or zucchini, or extra carrots. The green part of a leek is low-FODMAP; remove the coarse outer layers. I typically use some of the light green part, but do whatever you're comfortable with. If your leeks are cut off at the top, or smaller in size, use two. You want about 1 cup of chopped leek. This is absolutely fantastic baked in your Thanksgiving turkey (and if you do this, you’ll have about ½ the stuffing to bake and serve on the side), but there are instructions for baking the whole batch separately. The cornbread may be prepared up to 2 days ahead, and the stuffing may be assembled up to 1 day ahead and kept covered in the refrigerator. 1. Preheat oven to 400F and heat a 9-inch cast iron skillet in the oven for 10 minutes (If you don’t have a skillet, use a 9-inch cake pan; wait to place it in the oven until Step 3). In a small bowl, stir together the milk and vinegar; set aside for 5 minutes. 2. In a large bowl, whisk together the cornmeal, sugar, baking soda and salt. In a separate bowl whisk the egg. Add the milk mixture to the egg and whisk until combined. Add the wet ingredients to the dry ingredients and stir until moistened. 3. Take the hot skillet out of the oven (careful, handle is HOT) and add the butter. Return to the oven until butter melts, 1 to 2 minutes at most. Remove the skillet from the oven, swirl the skillet to coat the sides with butter, and pour the excess butter into the batter and whisk until combined (batter will be liquidy). 4. Pour the batter into the hot skillet and return to the oven. Bake 18 to 20 minutes, or until the top is golden brown and a toothpick comes out clean or with a few crumbs. Cool in skillet for 10 minutes, then invert onto a plate and invert again onto a wire rack. Cool completely. May be made up to 2 days ahead. Refrigerate in an airtight container. 1. Preheat oven to 350F. Cut cornbread into ¾-inch cubes and spread on a large rimmed baking sheet (bread will be a little crumbly, but that's great for stuffing). Bake until lightly toasted, tossing the bread around once or twice, about 20 minutes. Cool on baking sheet. May be done several hours ahead. Store at room temp in an airtight container. 2. Mist a large skillet with cooking spray and heat to medium high. Add pork, chile powder, and paprika; season with salt and pepper. Cook until meat is no longer pink, crumbling with your spoon, about 5 minutes. Transfer to a small bowl, leaving any pork fat remaining in the skillet. 3. Heat oil in the same skillet, with heat still at medium high. Add carrot, celery, leek, thyme, and tarragon; season with salt and pepper. Cook, stirring frequently, until tender and lightly browned, 7 to 9 minutes. 4. Add toasted cornbread to a large bowl. Add veggie mixture and pork; stir gently to combine. In a small bowl, whisk the egg; add 1 ½ cups of broth and whisk to combine. Add egg mixture to cornbread mixture and stir gently. For stuffing baked in a turkey, you want it to be on the dry side, but add a bit more broth if needed. 6. Add ½ to 1 cup of the remaining broth to the remaining stuffing so mixture is moist but not soggy. Mist a 1-quart (8x8-inch) baking dish with cooking spray and add stuffing. Drizzle melted butter over the top. Bake until lightly browned and heated through, 20-30 minutes at 350F (If you're baking something at the same time – like turkey – that requires a specific temp, you can bake the stuffing anywhere from 325F to 375F, adding or subtracting a couple minutes of baking time). Cool 5 minutes and serve.